In a medium pot, heat oil on medium. Saute garlic, onion, carrot, and spices for 3-5 minutes, until soft. Trim and coarsely chop broccoli. 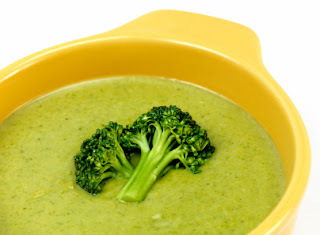 Add broccoli and water to pot and simmer, covered, on low for 15 minutes (until broccoli is soft). Uncover and cool for 5-10 minutes. Place in blender and puree until creamy. One cup of the following, cut in small pieces – organic celery, green beans, zucchini and potatoes (all organic). 1) Bring to a boil for 3 minutes in 1 litre of water. 2) Simmer for 20 – 30 minutes.